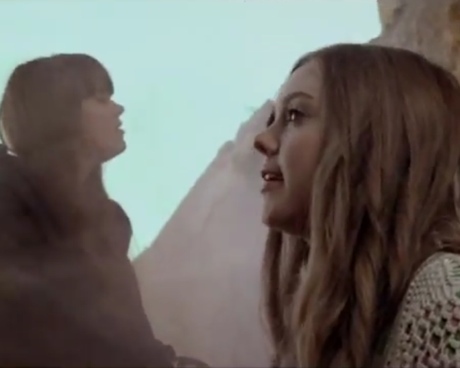 Swedish folk duo First Aid Kit have released a new video for the song "Emmylou." Sisters Johanna and Klara Soderberg have been getting support from some major artists in the genre, having performed with Fleet Foxes and Bright Eyes, with the latter's Mike Mogis producing the album and Conor Oberst helping out with some guest vocals. It's not too surprising, then, that the latest single "Emmylou" pays homage to two of country's great couples -- Emmylou Harris and Gram Parsons, in addition to Johnny and June Carter Cash. The video itself fully embraces a hippie aesthetic, with shots of the desert and the sisters perched on red rock, singing and engaging in some sort of spiritual ritual. The track appears on the duo's upcoming album The Lion's Roar, out January 24 via Wichita Records.